Hello all! Hope your holidays were fun and relaxing! After all of the family gatherings, I've been able to relax and watch movies with my husband and son. Alas, I must return to work tomorrow. 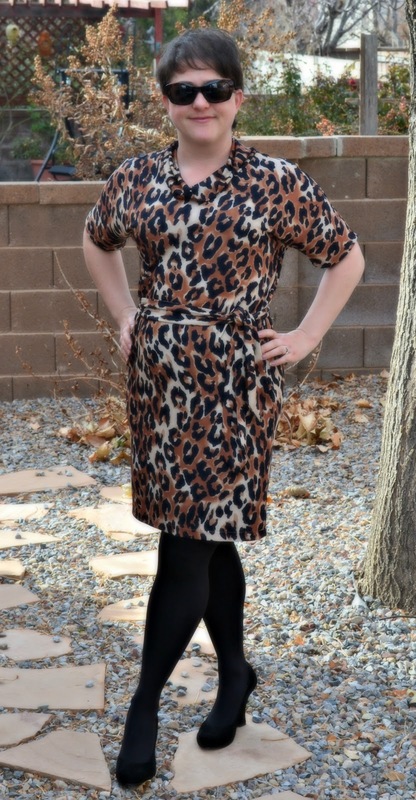 I swore I would never do animal print but this year I'm taking the plunge into the ever popular Fall/Winter trend! I have to say, it's kind of fun! Hopefully the Flinstones do not come to mind... LOL! I used Butterick 5247 (sorry for the blurred picture). I don't remember purchasing this pattern that long ago but apparently it is OOP. This is a 1-hr pattern (took me close to 2 hrs) for a dress or tunic with a cowl neck and tie belt. I used a poly/lycra blend jersey from Gorgeous Fabrics. It was a splurge for me- spent $27. But it is the perfect weight knit for this dress. It is beefy and not sheer at all. Plus I have just enough to squeeze out a top if I want. This was very easy to make. It took me almost 2 hrs because I use a conventional sewing machine and not a serger. The design has quite a bit of ease. I made a 14, which is 2 sizes smaller than recommended by my measurements but I still have plenty of room without it looking too big. The tie belt cinches it in to make this a rather simple, but flattering dress. I paired this with black tights and faux suede wedges (Merry Christmas to me!). Really great dress. I think it looks fabulous on you! I have that pattern and never saw such possibilities...I think with the right fabric, it really comes alive. That looks fabulous! I love that pattern. It's really comfortable and looks great on so many people. you look great in your animal print. Great dress! This dress is extremely flattering on you, and the fabric choice is great too.